LOGO Older people’s driving habits, visual abilities, and subjective assessment of daily visual functioning Professor: Liu Student: Ruby. 2 www.themegallery.comCompany Logo Objective  To find the relationship between the different situations of daily visual functions. 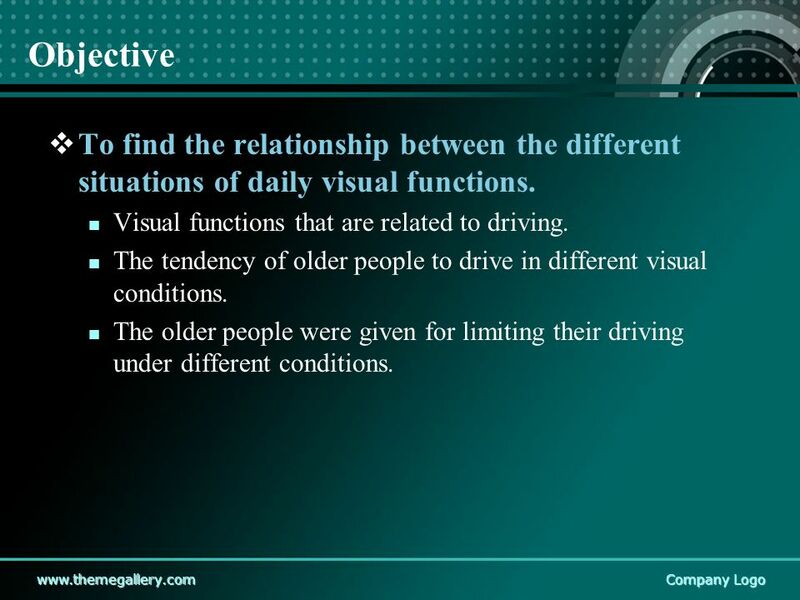 Visual functions that are related to driving. 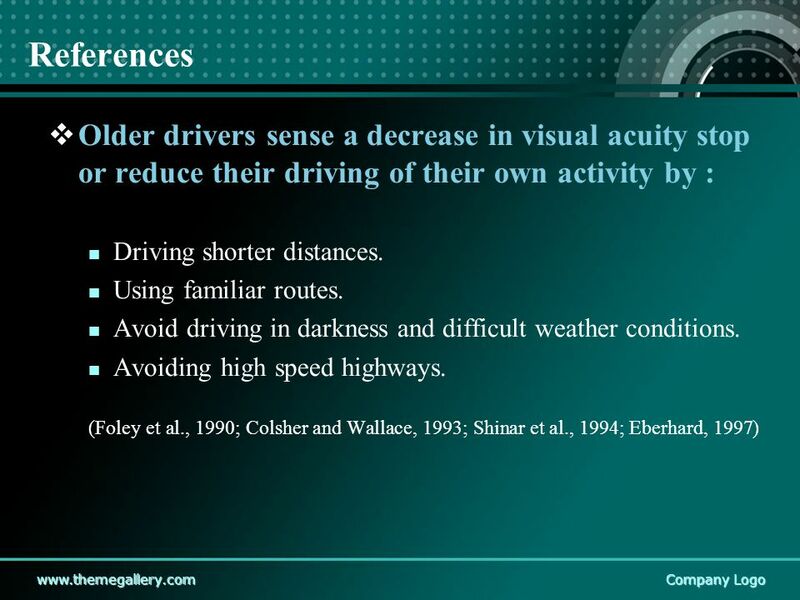 The tendency of older people to drive in different visual conditions. 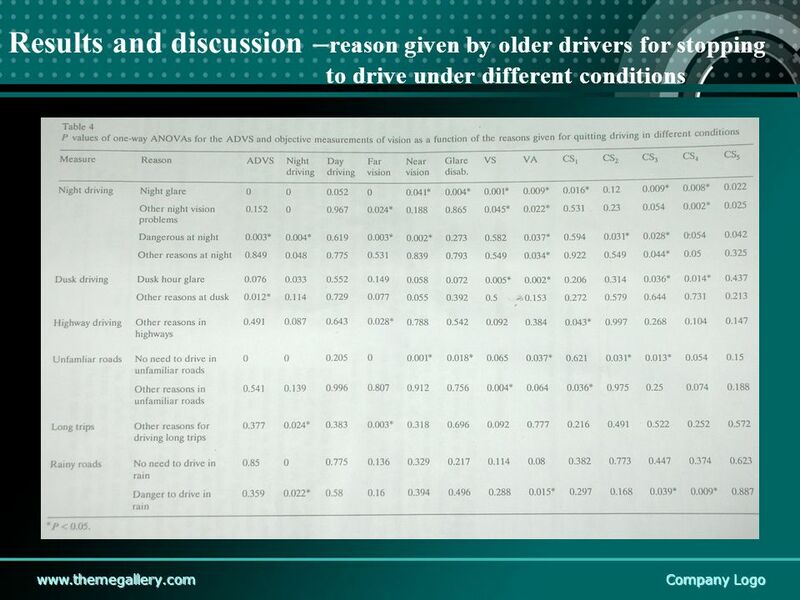 The older people were given for limiting their driving under different conditions. 6 www.themegallery.comCompany Logo Method  Subjects 80 adults ranging in age from 64-85 years old. (mean age 73) There were 29 female and 51 male. 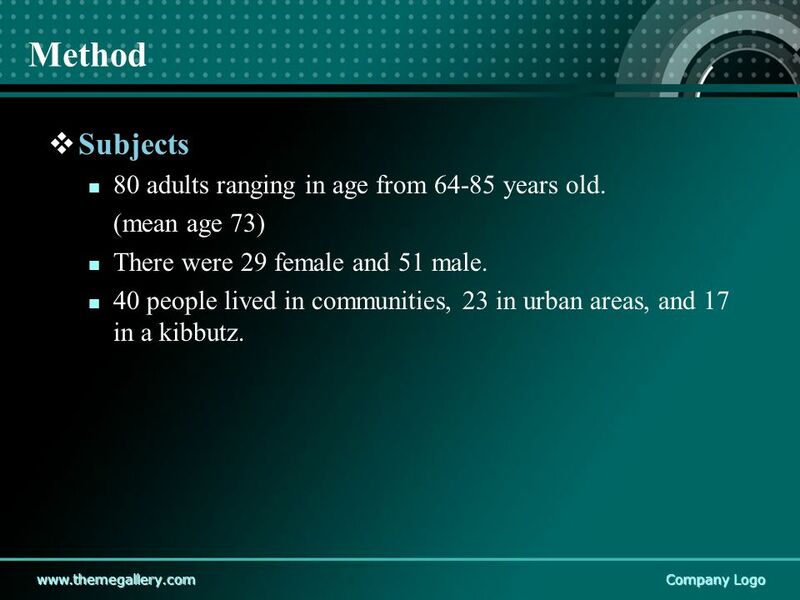 40 people lived in communities, 23 in urban areas, and 17 in a kibbutz. 7 www.themegallery.comCompany Logo Method-study tools and procedure  All subjects were respond to question on their driving activities and every day visual activities. 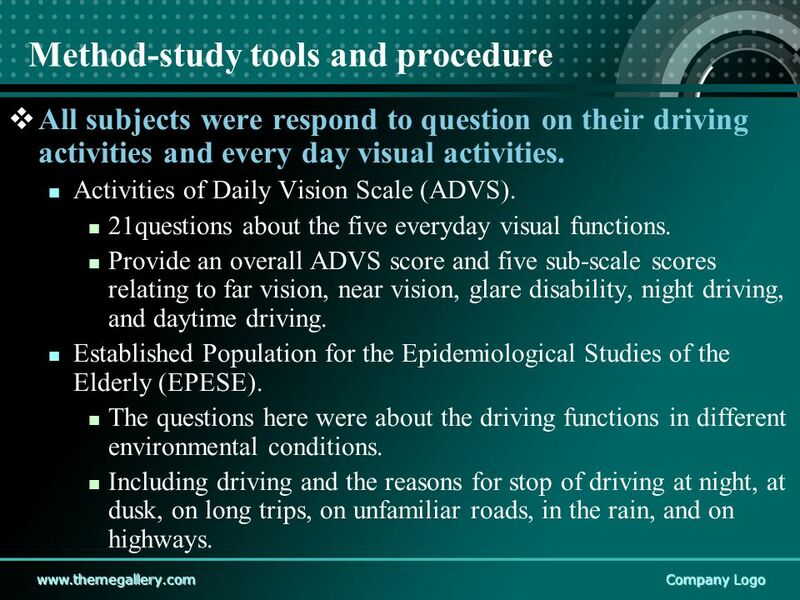 Activities of Daily Vision Scale (ADVS). 21questions about the five everyday visual functions. 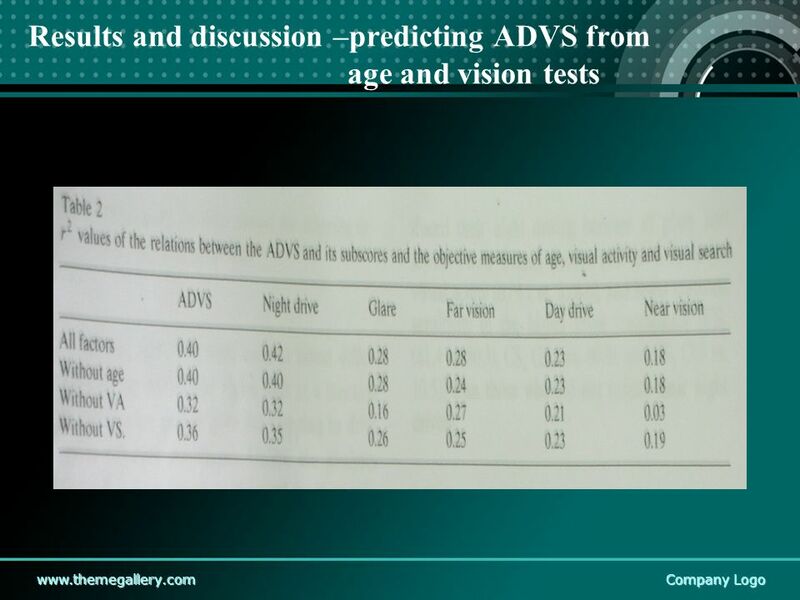 Provide an overall ADVS score and five sub-scale scores relating to far vision, near vision, glare disability, night driving, and daytime driving. 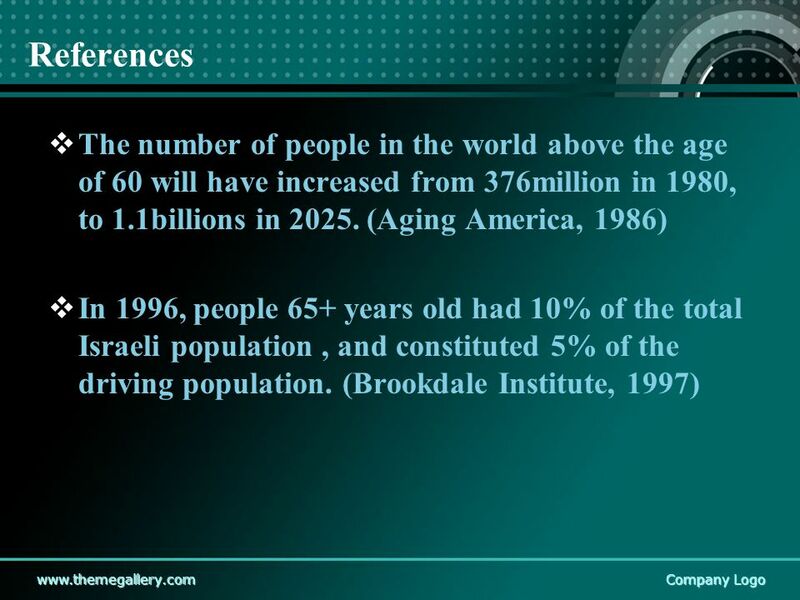 Established Population for the Epidemiological Studies of the Elderly (EPESE). The questions here were about the driving functions in different environmental conditions. Including driving and the reasons for stop of driving at night, at dusk, on long trips, on unfamiliar roads, in the rain, and on highways. 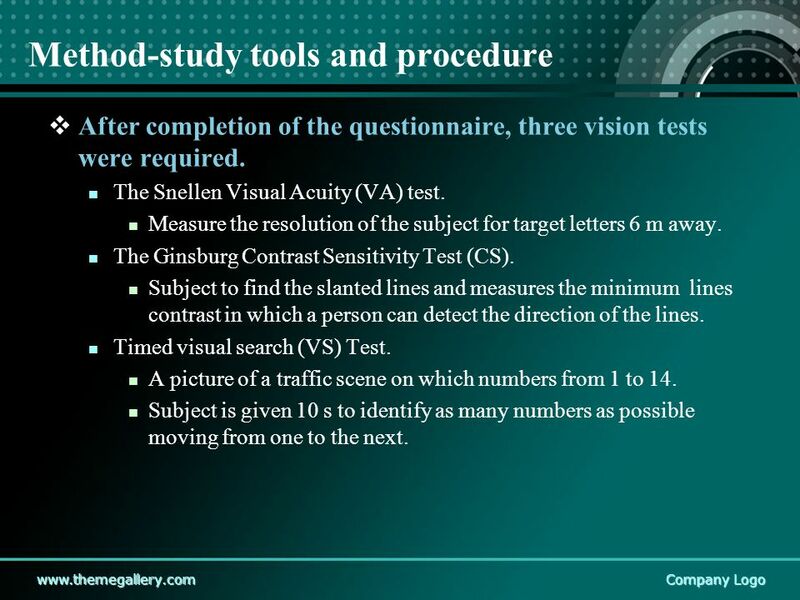 8 www.themegallery.comCompany Logo Method-study tools and procedure  After completion of the questionnaire, three vision tests were required. The Snellen Visual Acuity (VA) test. Measure the resolution of the subject for target letters 6 m away. The Ginsburg Contrast Sensitivity Test (CS). Subject to find the slanted lines and measures the minimum lines contrast in which a person can detect the direction of the lines. Timed visual search (VS) Test. A picture of a traffic scene on which numbers from 1 to 14. Subject is given 10 s to identify as many numbers as possible moving from one to the next. 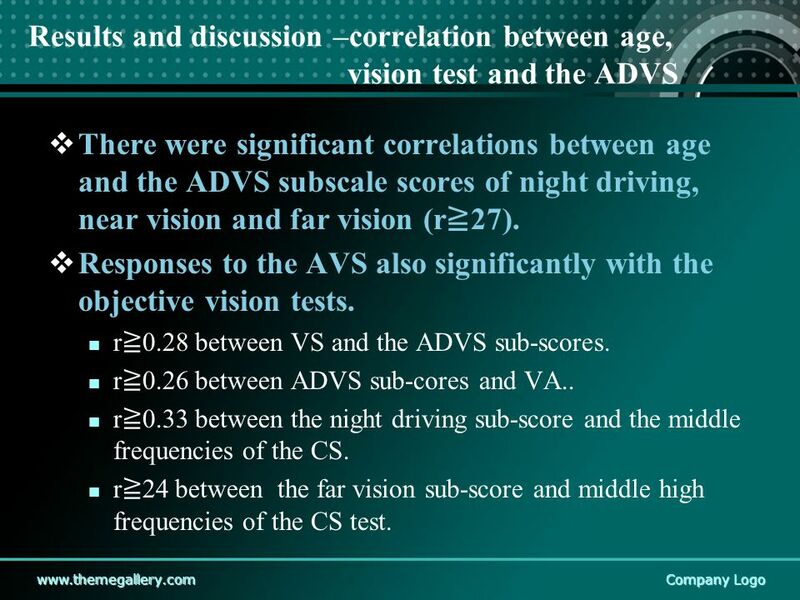 10 www.themegallery.comCompany Logo Results and discussion –correlation between age, vision test and the ADVS  There were significant correlations between age and the ADVS subscale scores of night driving, near vision and far vision (r ≧ 27). 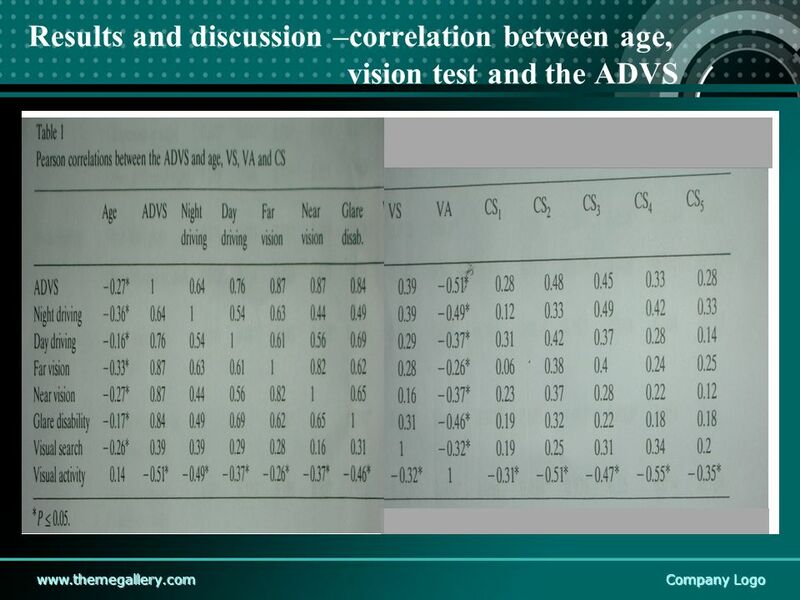  Responses to the AVS also significantly with the objective vision tests. r ≧ 0.28 between VS and the ADVS sub-scores. r ≧ 0.26 between ADVS sub-cores and VA.. r ≧ 0.33 between the night driving sub-score and the middle frequencies of the CS. r ≧ 24 between the far vision sub-score and middle high frequencies of the CS test. 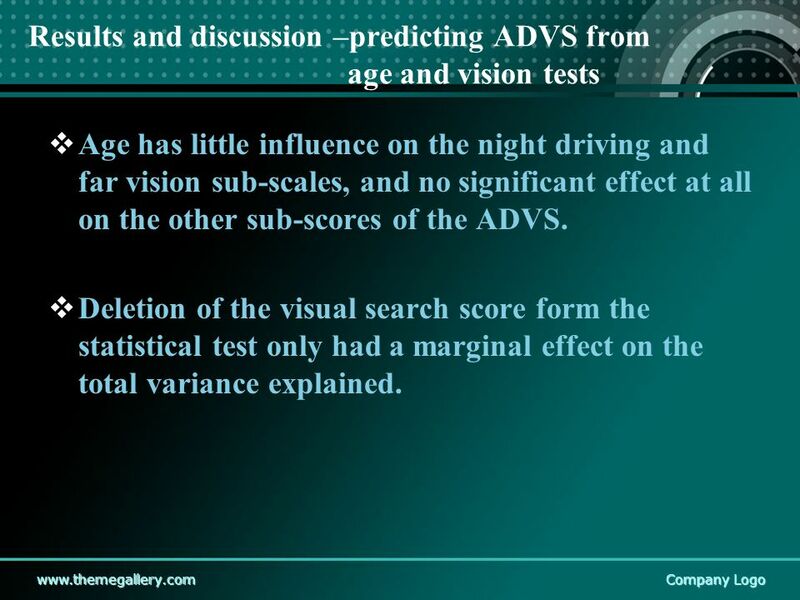 12 www.themegallery.comCompany Logo Results and discussion –predicting ADVS from age and vision tests  Age has little influence on the night driving and far vision sub-scales, and no significant effect at all on the other sub-scores of the ADVS.  Deletion of the visual search score form the statistical test only had a marginal effect on the total variance explained. 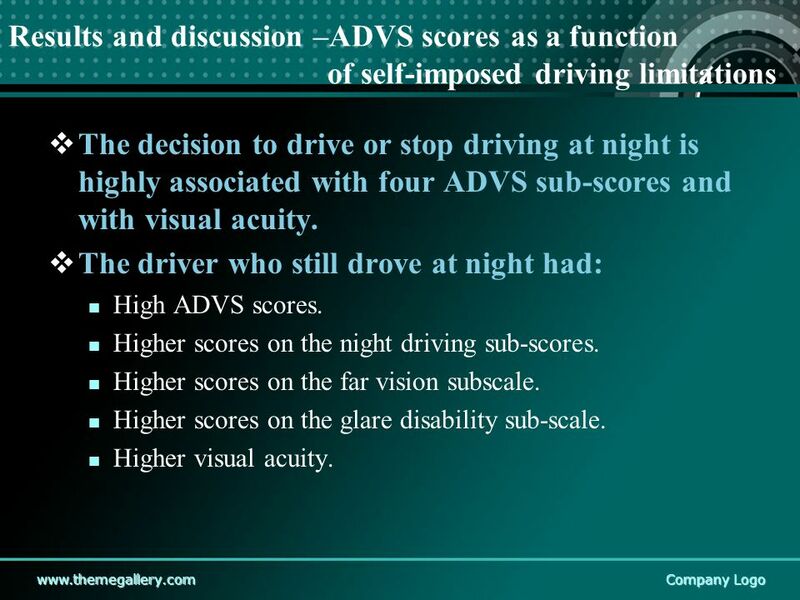 14 www.themegallery.comCompany Logo Results and discussion –ADVS scores as a function of self-imposed driving limitations  The decision to drive or stop driving at night is highly associated with four ADVS sub-scores and with visual acuity.  The driver who still drove at night had: High ADVS scores. Higher scores on the night driving sub-scores. Higher scores on the far vision subscale. Higher scores on the glare disability sub-scale. 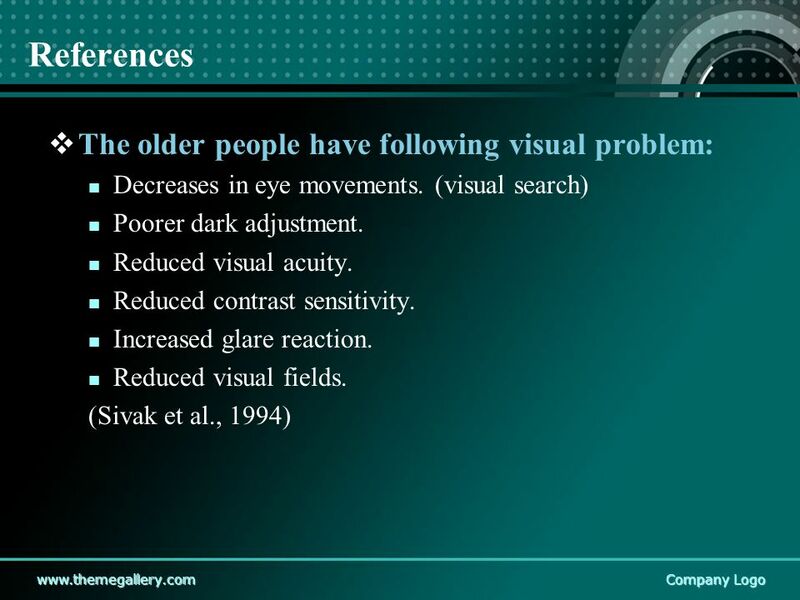 Higher visual acuity. 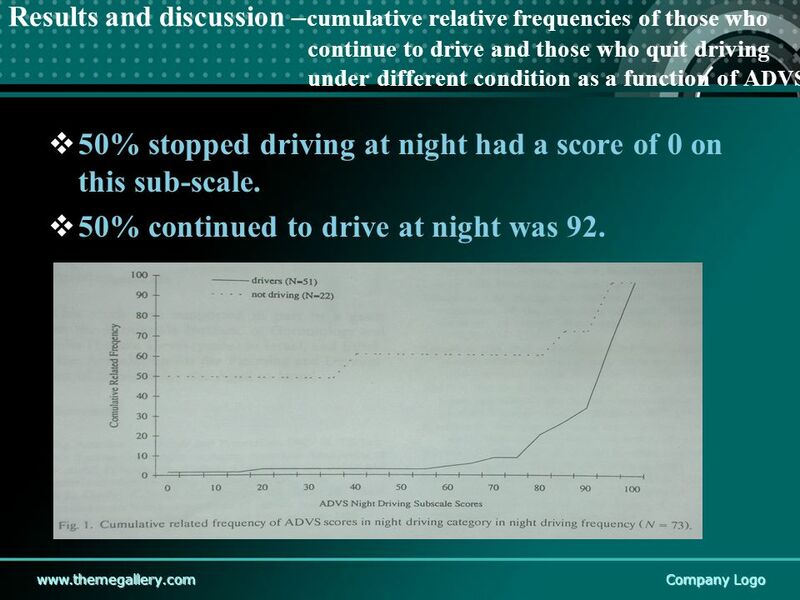 17 www.themegallery.comCompany Logo Results and discussion – cumulative relative frequencies of those who continue to drive and those who quit driving under different condition as a function of A DVS  50% stopped driving at night had a score of 0 on this sub-scale.  50% continued to drive at night was 92. 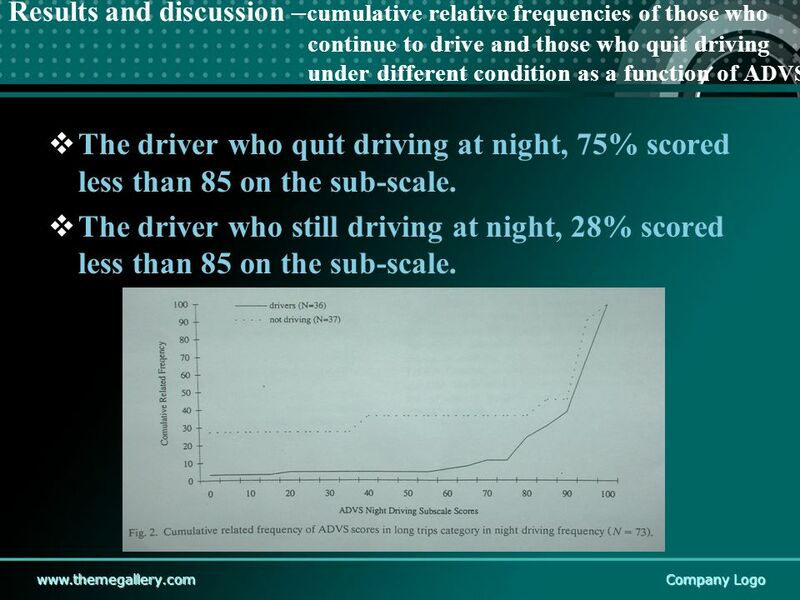 18 www.themegallery.comCompany Logo Results and discussion – cumulative relative frequencies of those who continue to drive and those who quit driving under different condition as a function of A DVS  The driver who quit driving at night, 75% scored less than 85 on the sub-scale.  The driver who still driving at night, 28% scored less than 85 on the sub-scale. 19 www.themegallery.comCompany Logo Results and discussion –the associations among different self- imposed driving restrictions  Older driver rarely drove at dusk also rarely drove at night. 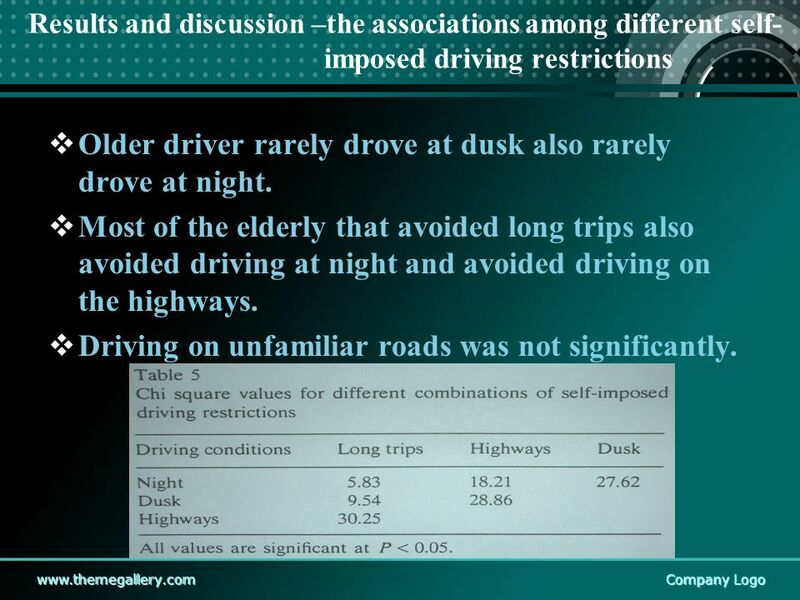  Most of the elderly that avoided long trips also avoided driving at night and avoided driving on the highways.  Driving on unfamiliar roads was not significantly. 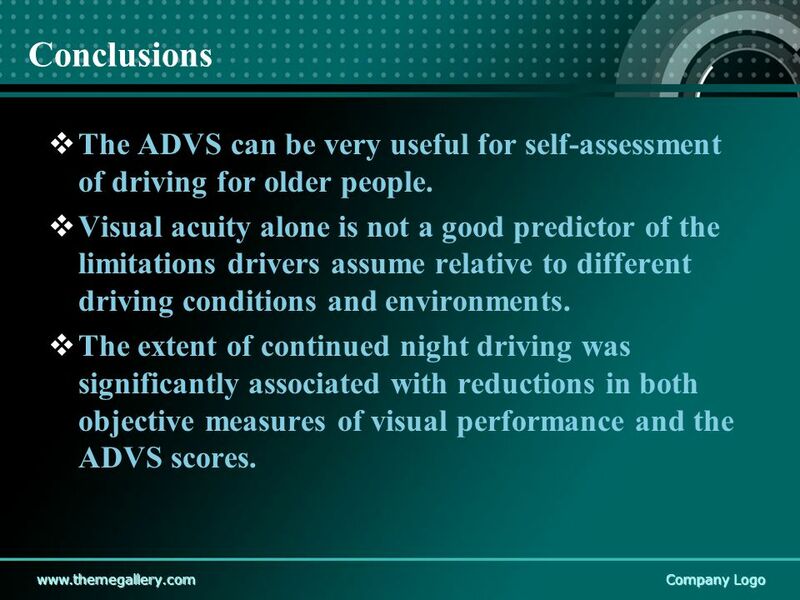 20 www.themegallery.comCompany Logo Conclusions  The ADVS can be very useful for self-assessment of driving for older people.  Visual acuity alone is not a good predictor of the limitations drivers assume relative to different driving conditions and environments. 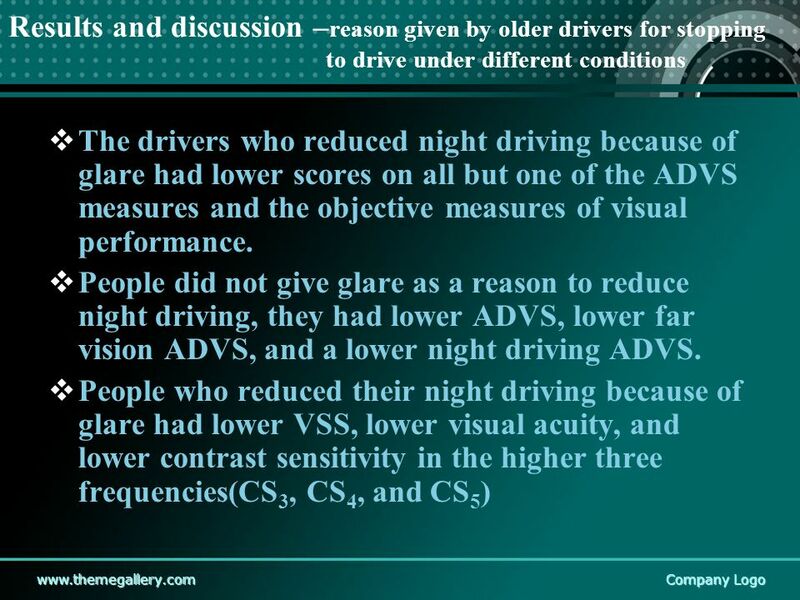  The extent of continued night driving was significantly associated with reductions in both objective measures of visual performance and the ADVS scores. 21 www.themegallery.comCompany Logo Conclusions  The night driving sub-scale is most closely associated with impaired in objective visual measure. 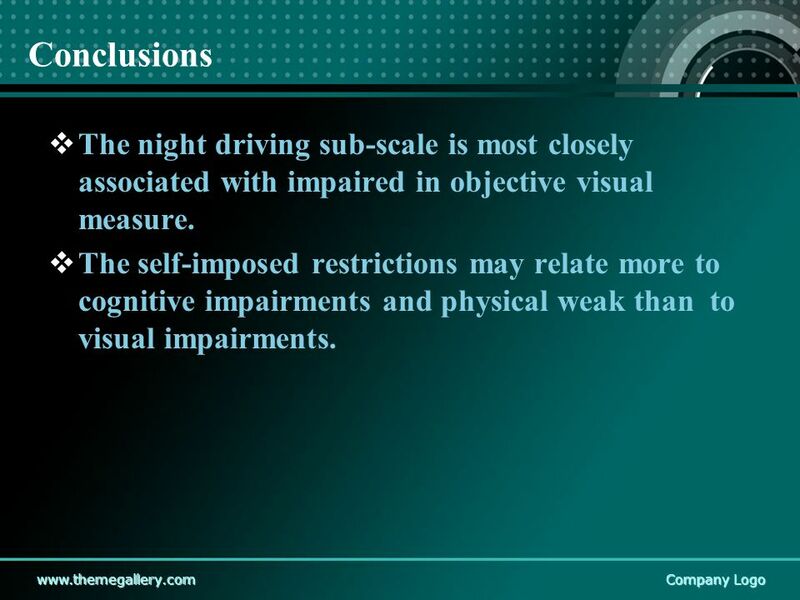  The self-imposed restrictions may relate more to cognitive impairments and physical weak than to visual impairments. 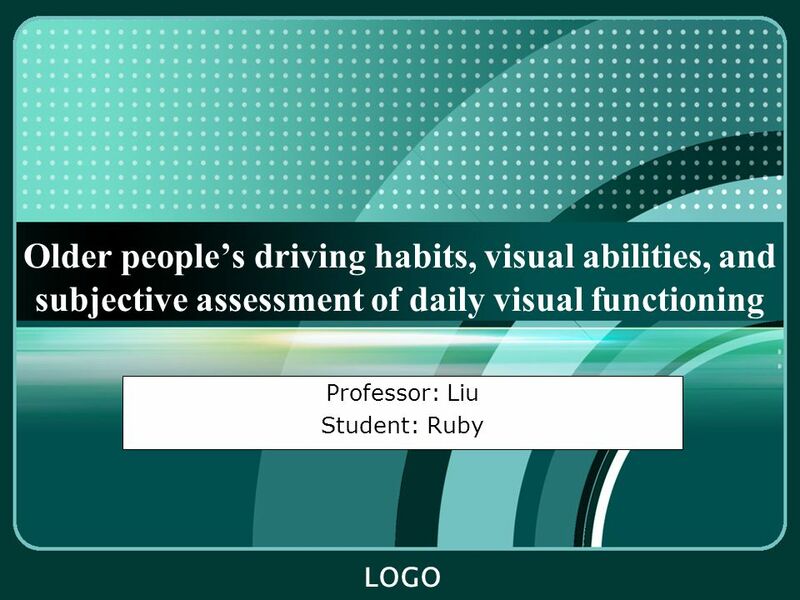 Download ppt "LOGO Older people’s driving habits, visual abilities, and subjective assessment of daily visual functioning Professor: Liu Student: Ruby." Measuring Personal Growth Attributed to Multicultural Education Constructs Personal Growth Positive psychological changes during time period of interest. 1 Adolescence Chapter 11: Sexuality 2 What do these women have in common? Module 20: Correlation This module focuses on the calculating, interpreting and testing hypotheses about the Pearson Product Moment Correlation. Defensive Driving What are the attributes of a good driver? LOGO Relative effects of age and compromised vision on driving performance Professor: Liu Student: Ruby. Eye Movements of Younger and Older Drivers Professor: Liu Student: Ruby. Drivers’ Education September 23, 2013. Physical Condition of the Driver  Good Vision: a necessary quality for all drivers because driving relies on seeing.